The Swabian village in Banat was populated between 1765 and 1767 as the first hamlet in the time of Theresan settlement. Biled is located in an area of meadowland which was unpopulated until that time and which is fertile, yet marshy. Apart from animal husbandry, the inhabitants lived off basketry and fishery, due to the rich population of carps and pikes in the area. The village was thought as a model for later colonist settlements. Therefore, Biled was used as a training ground for the measuring and allocating of ground in square fathoms and the planning of further settlements in the Josephinist time. Thus, rectangular streets inspired by check boards were created. Those parts of the houses which faced the street were richly decorated, a style which came to be known as “Banat Baroque“. Further, the houses usually had an arbour towards the yard (called “uffne Gang“ in German, which means “open corridor“). To avoid fires, the space between the houses was regulated strictly. Even the distance from the ditches, which held rain water, to the houses was fixed and all buildings were lined up in an orderly fashion. Count Claudius Florimundus Mercy d‘Argenteau was the first owner of Biled. He was the first governor of the whole of Banat and when receiving the title of Count in 1719 he received Biled as well. From 1800 to 1918, Biled was in the hands of the diocese of Agram/Zagreb, which had to dismiss their claims to the area at the end of World War I when Southeast Europe was reapportioned. After the village had been taken over bye the diocese of Agram, the demands of the local church had grown steadily. In 1833 then, it received a baroque extension. Opposite of the church the “Kastell“, summer residence of the Bishop of Agram, was located which was sold later on. Around 1910, Biled was one of the biggest settlements in the moorlands of Banat, with 4.000 inhabitants (3.600 of them Germans). Today, less thean 100 German people live in Biled. The Banat-German settlements were deeply affected by the two World Wars. Memorials for those who fell in the World Wars, but also commemorating the victims of the deportation to Russia between 1945 and 1949 and the deportation to the Romanian Bărăgan steppe in 1951 can mostly be found in the Roman Catholic churches and the adjoining churchyards and cemetery chapels. 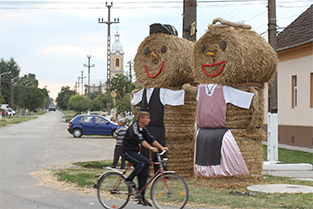 After the migration of many Banat Swabians to Germany and America in the 1980, the area was resettled with people from all over Romania. Thus, the stately Banat-Swabian farmhouses were given to new owners. Some renovated and preserved the gable walls, others removed the names of the former owners and the year of construction and added their own name and the year of renovation. Some others then only cared for the houses insufficiently. 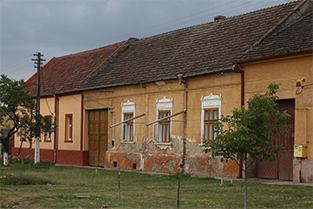 Therefore, the houses in Biled, which were once so uniform, tell a story of their owner‘s attitude towards the culture of Banat Swabians nowadays. The stately Banat-Swabian farmhouses still tell a story of former wealth.